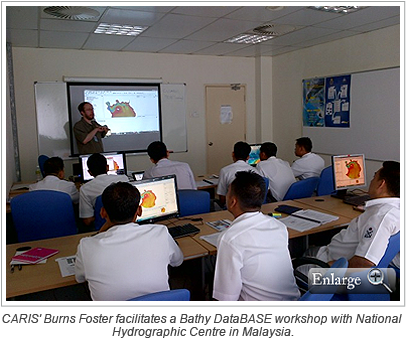 National Hydrographic Centre (NHC), Royal Malaysian Navy (RMN) is the latest of a growing number of organizations to implement Bathy DataBASE to address their requirement for advanced analysis and management of historic and high-resolution elevation data. As part of NHC's hydrographic, oceanographic and cartographic responsibilities for Malaysian waters, they create and update comprehensive databases through surveys, re-surveys and data received from other maritime authorities. NHC has used CARIS solutions since 1993 to achieve these objectives and was an adopter of the early CARIS database technology, Geographic Database Manager (GDM), which provided hydrographic agencies with a solution for the storage and management of sounding data.